Alsace is a wine growing region in northeastern France that lays between the Rhine river and the Vosges mountains. Over 90% of the wines produced in Alsace are white grape varieties including; Riesling, Pinot Blanc, Gewurztraminer, Pinot Gris, Muscat, and Sylvaner. Pinot Noir is the singular red grape variety produced in the region. 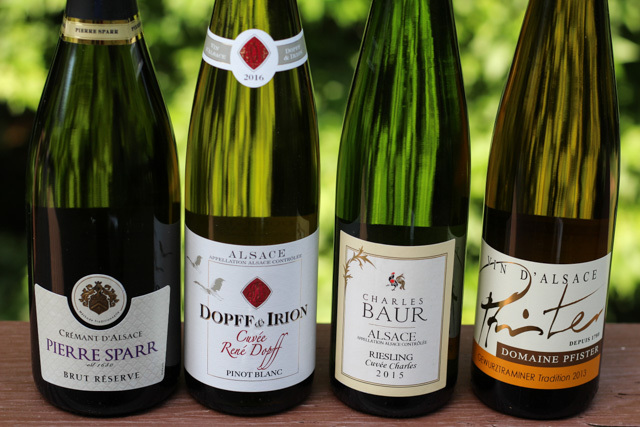 The Alsace white wines are known for their true expression of varietal character and the terroir where they are grown. Alsatian white wines are typically dry with aromas and flavors of fruit, flower, or spice combined with noted minerality, acidity, and structure; making for food-friendly pairings. This month along with my fellow French Winophiles we are exploring the wines of Alsace. Thanks to @DrinkAlsace, the coordinators of #AlsaceRocks for supplying many of the group with wine samples. The group was divided into three different themes; Group One Pinot Pinot Pinot received four different “Pinot” Wines, – A Crémant Pinot Blanc, Pinot Blanc, Pinot Gris, and Pinot Noir, Group Two Terroir and Riesling received four Grand Crus wines from four different soils, and Group Three Food Pairing Challenge received a Crémant, Riesling, Pinot Gris/or Pinot Blanc, and a Gewurztraminer. Join our Twitter chat Saturday, June 16th at 11:00am ET using the hashtag #winophiles. Be sure to check out the blog posts from my fellow French Winophiles and their discoveries of Alsace based on their theme and wines at the bottom of this post. Disclosure: The wines in this post were provided by Alsace Wines. All opinions are my own. I was part of the food pairing challenge and received the Alsace wines pictured below. Light straw in color with fine persistent bubbles. Dry, medium+ acidity, medium body with a smooth, rich mouthfeel. Notes of citrus and minerals with a balanced elegant lingering finish. Food Pairing Tip: The perfect aperitif and appetizer wine. Cheeses: Brie, Triple Crème, and goat cheese. Pale straw in color. Dry, medium acidity and body. Notes of citrus, stone fruit, and a hint of white pepper. Food Pairing Tip: The refreshing crispness makes a nice pairing with appetizers, picnic fare and simply prepared dishes with poultry, fish, salad, even creamy based risotto, and the local specialty; tart flambée. Cheeses: Greek feta, Port Salut, and Saint André. Pale/medium straw in color. Dry, medium acidity and body. Notes of citrus and minerals. Food Pairing Tip: The lean and refreshing Rieslings of Alsace are the perfect pairing with charcuterie made with smoked salty ham and smoked rich tasting sausages, spiced foods with mild curry, cardamom, cinnamon, cloves, ginger, star of anise, cumin, or turmeric, picnic fare, shellfish and egg dishes. Cheeses: Mild blue cheese like Gorgonzola Dolcelatte and mild sheep’s milk cheeses. 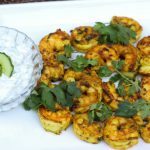 Indian Spiced Shrimp with Raita – recipe below. Pale/Medium straw in color. Off-dry, medium- acidity and medium+ body. Notes of honey, exotic spices, herbs, and floral. Food Pairing Tip: Game birds like goose and duck, foie gras, pork and ham dishes, cuisines with spices like cloves, coriander, allspice, cinnamon, ginger, and curry, not too sweet fruit chutney, fruit salsa, and pickled fruit. Cheeses: strong aged like Camembert, Epoisses, and Roquefort. 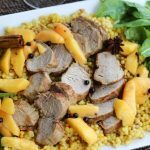 Pork Tenderloin and Pickled Peaches – recipe below. Author: adapted from "thekitchn.com" and "Rodale's Organic Life Magazine"
Preheat the oven to 450F. Place a 12 inch cast iron skillet in the oven for about 10 minutes. In a small bowl mix the Garam Masala, cumin, salt and pepper together. Dry the pork tenderloins and lightly coat them with olive oil. Rub the tenderloins with the spice mix, coating all sides. Carefully remove the preheated cast iron skillet from the oven with oven mits, and add olive oil to just coat the bottom of the skillet. Place the tenderloins in the pan and return it to the oven. Roast for 10 minutes and then turn the tenderloin to the other side. Reducing the oven temperature to 400F and roast for another 10-15 minutes. Internal temperature should be 140-145F. Remove from skillet and rest on cutting board, covered with foil for about 10 minutes. Slice and serve with pickled peaches. In a stainless steel or enamel pot, add the sugar, vinegar, cloves, cinnamon sticks, star of anise, black peppercorns, and 1/3 cup water. Bring the mixture to a boil over medium heat, stirring to dissolve the sugar. Once the sugar is dissolved, reduce the heat to medium-low and add the peaches. Cook without boiling for about 10-15 minutes. With a slotted spoon, carefully spoon the peaches into a clean quart-size jar. Add the syrup and spices, filling to within 1/2 " of the top rim. Chill for about 4 hours before serving. Peaches will keep in the refrigerator for 2 months. The Indian spices of coriander, cumin, and turmeric with the shrimp make for a nice pairing with a lean dry Riesling from Alsace. In a medium bowl combine all the ingredients for the shrimp and stir to mix. Cover and refrigerate for at least one hour or up to three hours. Remove the shrimp from the marinade. In a cast iron skillet over medium high heat add one tablespoon olive oil. When the oil is warm add the shrimp and sauté 2-3 minutes per side. Remove to a serving platter. In a small bowl combine all the Raita ingredients and stir well to mix. Serve with the shrimp as a dipping sauce. A special thank you to Drink Alsace for supplying the wine samples. Two lovely pairings, Jane! 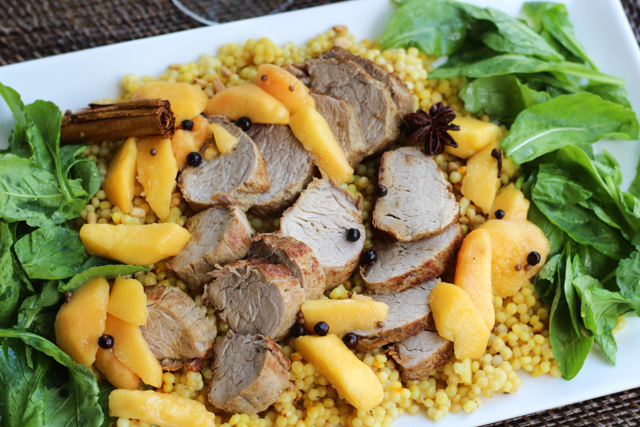 I love pickled peaches with pork, and your recipe sounds like the perfect summer dish. The shrimp raita looks wonderful, too. Thanks Lauren, the peaches are so tasty right now in Georgia! Your pairings look delicious. Cannot wait to see how you pair the other two wines. I love Gewurz with cheese. Actually I started the tasting with a cheeseboard. Cheese + white wine makes for some great pairings too. Nice post, Jane! I totally making that shrimp recipe! Thanks Liz, I think shrimp appetizers alway get people’s attention. 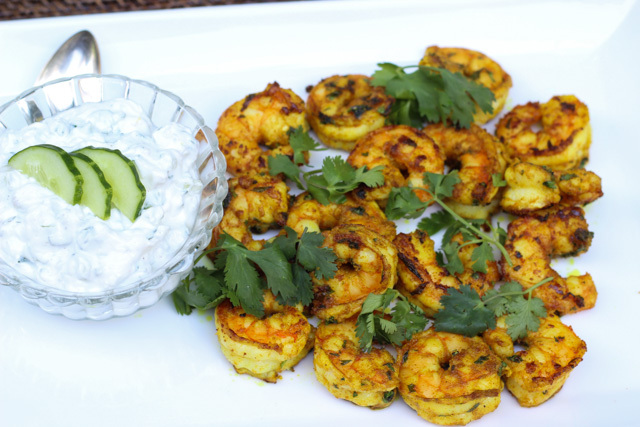 The Indian spiced shrimp with raita was a delicious pairing with the Alsace Riesling! Let me know how you like them! Delicious pairings! I had a different Pinot Blanc but otherwise the same flight, and really enjoyed the wines! See you next month! Two great recipes and the pairings sound very successful. Thanks for sharing. Your dishes look to be great choices for Alsace wines. I’ll bet the shrimp raita would have paired nicely with the Gewurztraminer as well. Cheers! This all looks so fantastic! Yum! I’m going to have to try this recipe from the ‘Winemaker Cooks,” also love the idea of the pickled peaches. I’m just going to bookmark this and then find these wines to try all your pairing suggestions. 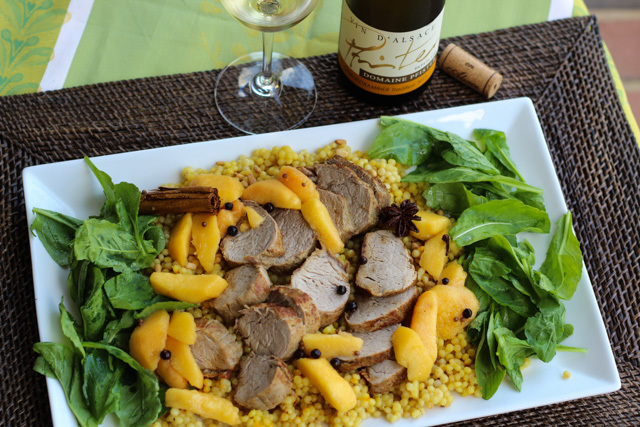 First on my list is to make that beautiful pork tenderloin with pickled peaches and find a nice Alsatian Gewurztraminer! I love your recipe pairing suggestions Jane, especially the Indian food dish! Great post! What delicious recipes! I need to try them both.